This record lacks meaningful musical substance. It also lacks coherence as an album statement. Pianist Marc Cary is a constant, but alto saxophonist Donald Harrison and trumpeter Wallace Roney come and go. Ensemble configurations and genres shift track-to-track. The mélange includes guest musicians from Mali, five different bassists, ethnic and electric instruments, digital devices and a vocal track. The album is interesting, however, from two perspectives. First, it presents an unusual concept of the drummer as bandleader. Will Calhoun’s drums are so dominant in the mix that the normal ensemble balance is inverted. The drums are the primary subject, and the melody lines and improvisations of the horns and piano are the secondary accompaniment. 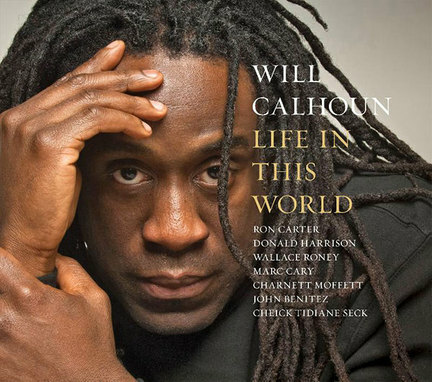 Calhoun’s percussion instruments are beautifully recorded. His bass drum goes down deep. The concept would be more interesting if Calhoun were more into nuance and less into bashing. The second perspective has to do with fusion. Remember fusion? People had high hopes for it, way back in the last century. Calhoun is qualified to practice fusion. He is a member of the high-profile rock band Living Colour, graduated from Berklee and grew up on bebop. The problem with fusion was that jazz and rock didn’t fuse. Calhoun solves the problem by not trying. Instead he juxtaposes them or causes them to collide. On four pieces from the jazz repertoire-“Love for Sale,” “Naima,” “Evidence” and “Etcetera”-the melody is overwhelmed by Calhoun’s alternative rhythmic agenda. Even Monk’s spiky energy is submerged in onslaughts of African/rock thunder. It’s rather fun, even if you only have to hear it once. The explicitly pop-oriented pieces are throwaways, like “Dorita,” on which Harrison is as saccharine as smooth jazz, and “Love’s Parody,” which will hopefully be Calhoun’s last attempt to sing in public.